This pouch was designed with input from some high speed friends that had need of both a shingle for 7.62X51 box magazines and double stack pistol magazines. 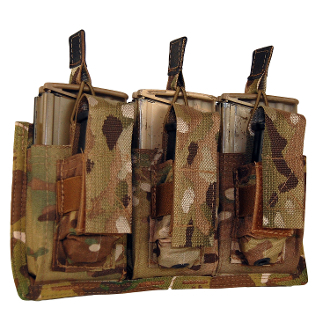 The main magazine pouch bodies fit a single M14/M1A, SR25 or FAL/L1A1 magazine in each cell and the magazines are retained by a bungee retainer and pull tab with SureGrip material on the tab itself. The pistol magazine pouches were sized around a Glock magazine, but because of an elastic retainer around the body of the pistol magazine pocket, a wide variety of magazines will fit, from single stack 1911's through Glock 20/21, and more. The lids on the pistol magazine pockets are adjustable for length and can be removed completely if the shooter wishes to. As with all ATS Tactical Gear, the pouch is made in the US of A and covered by a lifetime warranty against defects in materials and workmanship. Copyright © 2014-2019 A2Z Gear. All rights reserved.